Opportunities to see a Marx Brothers film on the big screen are very rare, so don’t miss unique chance, which is part of our season of five remastered comedies from the BFI. 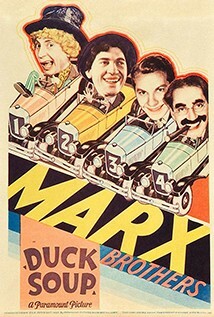 Arguably the Marx Brothers' funniest film, this comedy masterpiece contains several famous scenes, including perhaps the greatest physical comedy routine in slapstick history – the hilarious mirror sequence. A wealthy widow offers financial aid to the bankrupt country of Freedonia on condition that Rufus T. Firefly (Groucho Marx) be made leader. But his chaotic, inept regime bumbles into war with neighboring Sylvania, all the while pursued by a pair of spies (played by Chico and Harpo Marx). But all this is secondary to a series of wildly elaborate set-pieces, and mind-scramblingly relentless one-liners (“Why a four-year-old child could understand this report… run out and find me a four-year-old child, I can’t make head or tail of it”).